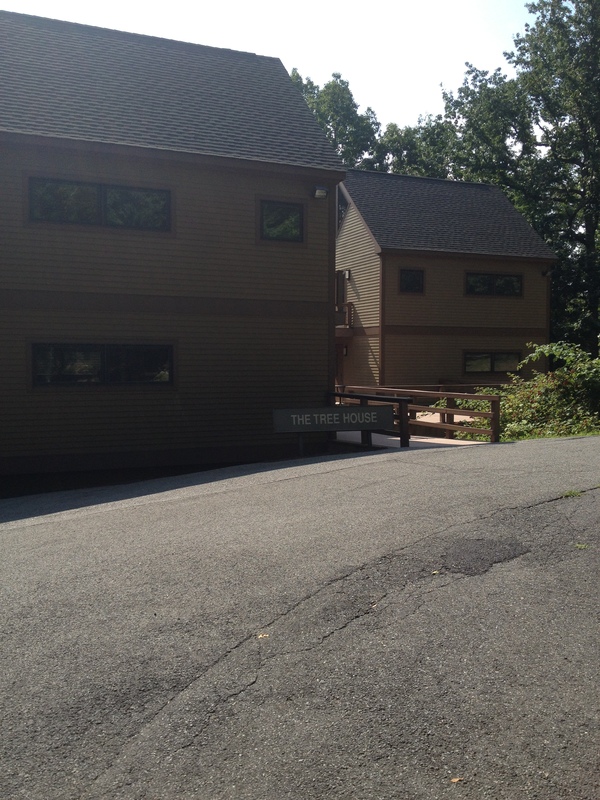 I made time for a learning walk this morning, just a 30 minute or so ramble up the paths around this conference center in the woods. For me a learning walk is a quiet introspective time for noticing the world around me. I find that in addition to looking for interesting images to capture with my iPhone, I am more attuned to sounds during a learning walk. This morning’s walk in the warm, but not too warm sun of Westchester, New York was accompanied by a symphony of birds as they called to one another and flitted through the leaves and branches of the plentiful trees. The backbeat percussion was provided by the hum of cicadas. Occasional scurrying sounds suggested that I was not alone on my walk. 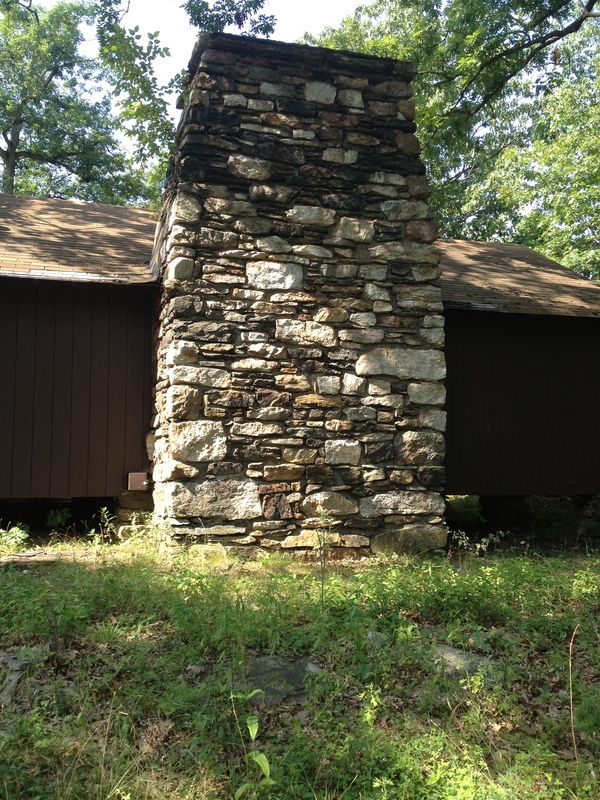 As I headed up the hill I noticed this rustic chimney on a building along side the path. I went around the other side hoping to find a beautiful old building, but really, the chimney was the outstanding feature. I noticed a sign pointing the direction of the tree house. A tree house? I was intrigued and continued my walk. This isn’t my definition of a tree house. Looks more like a conference building near trees–not stunning or particularly interesting. 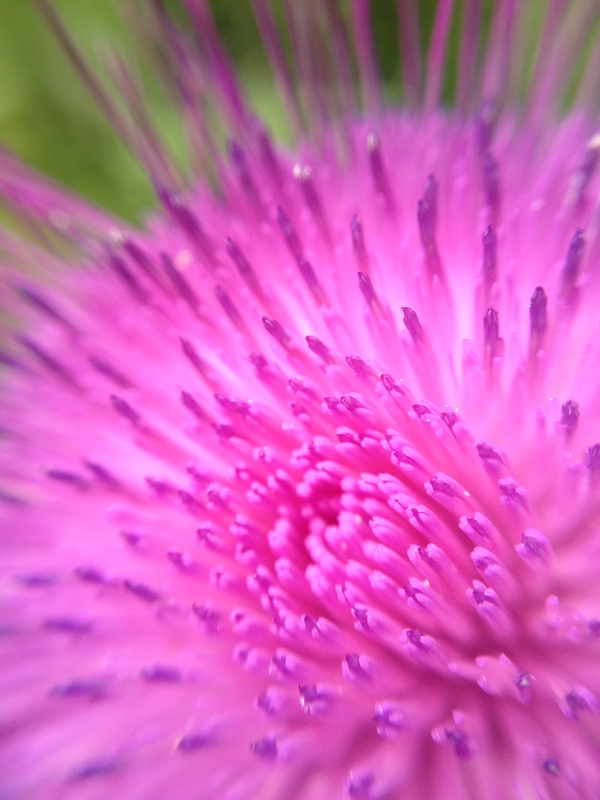 But…I took a few minutes to sit on a picnic bench and attach my macro lens to my phone and then set off to explore some of the plant life. 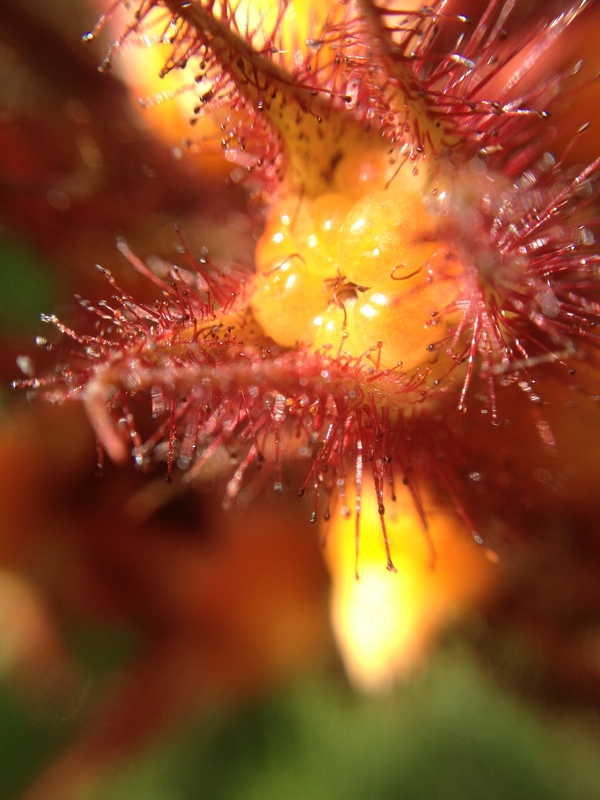 I love the texture of this thistly plant…and its spiky stem and leaves. But this week is orange in my photo-a-day challenge, so while I was drawn to this beautiful purplish-pink I continued to look for examples of orange. 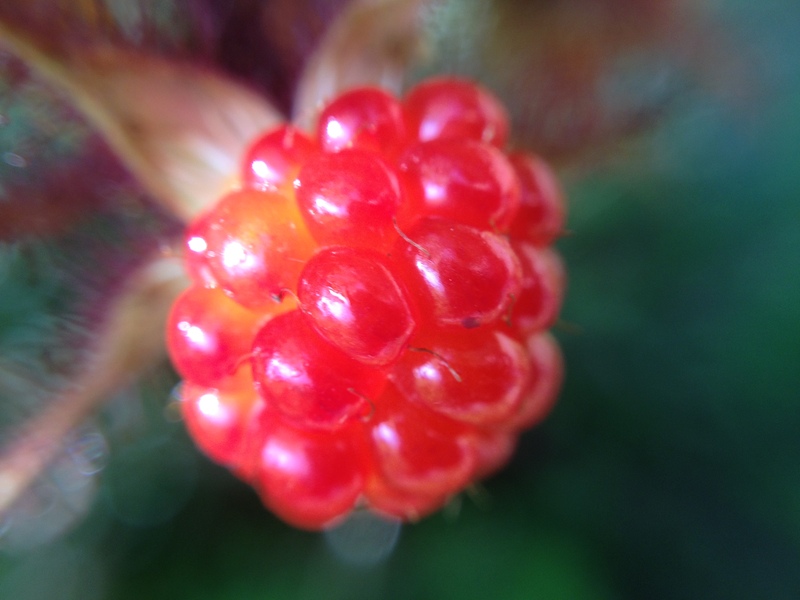 I discovered that these berries that I had seen as red, had a stage where orange was prominent. And I love the hint of orange highlights on this berry! 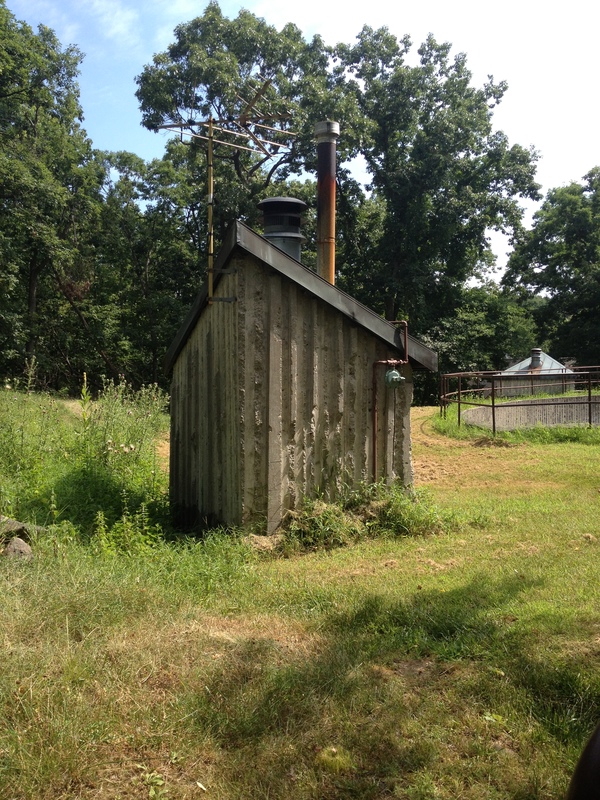 As I looped around the tree house to head back I noticed some other buildings and happened on this interesting little building…with a rusty orange stovepipe! I backtracked the way I had come, noticing things I had missed on my way up. 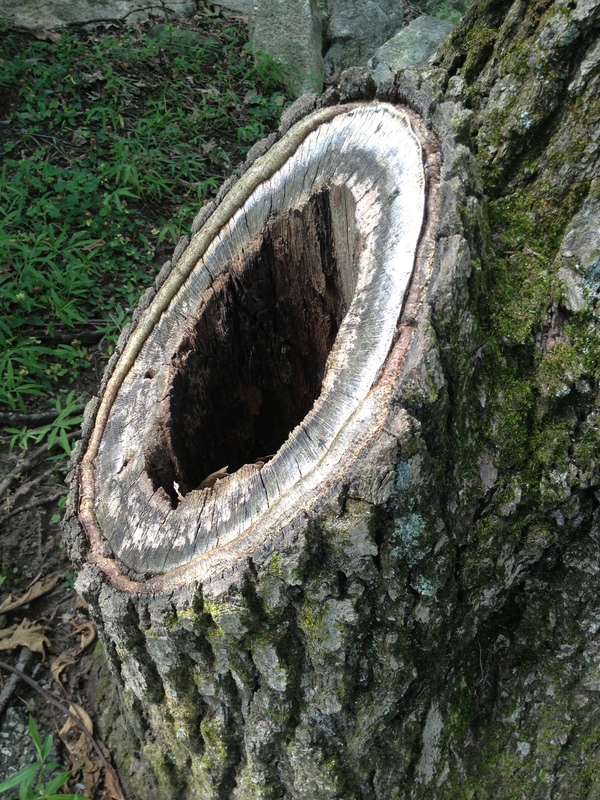 A tree stump with a hole. I wonder what might live in there? 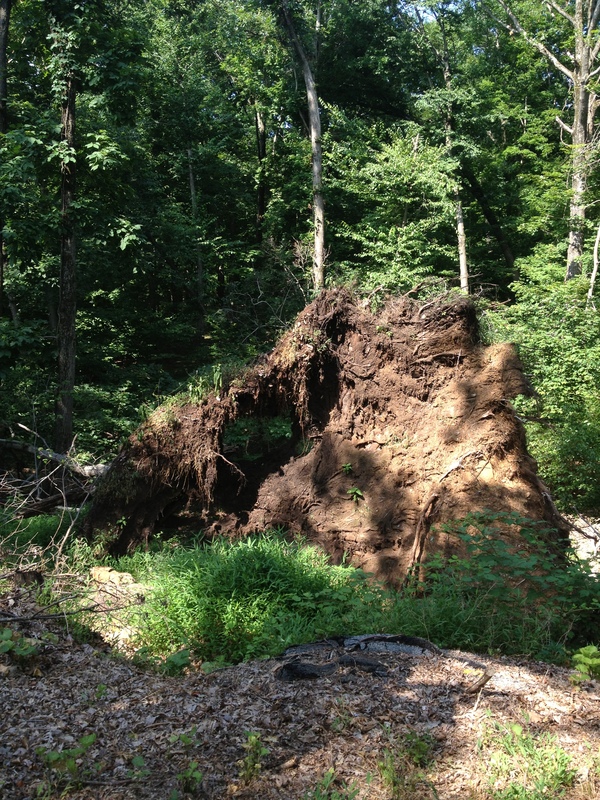 I also wondered if there were storms here in the winter. These roots from a very large tree are facing up instead of anchoring the tree in the ground. 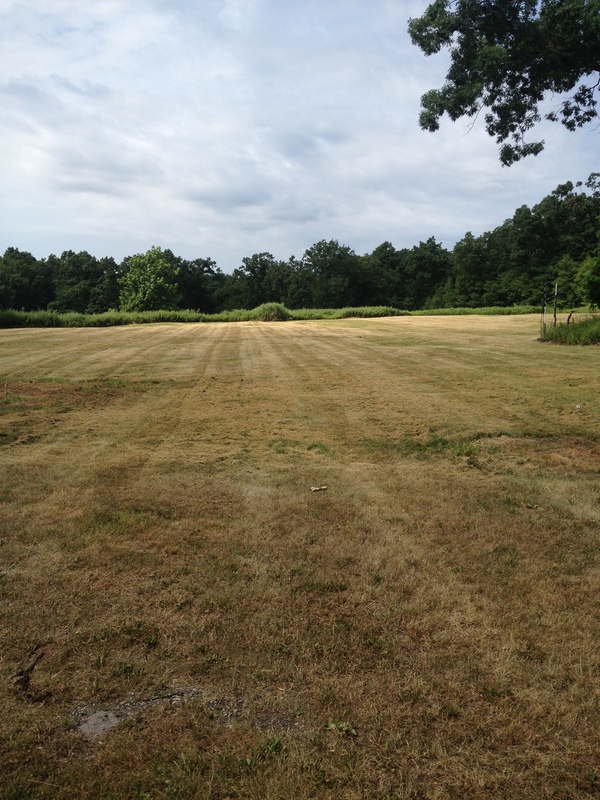 I came across this clearing…a surprise opening in the otherwise moderately dense woods. I wonder why this space is open? Does it have a use? Is it a pasture of some sort? It looks freshly mowed. I returned to the conference center with lots of interesting things to think about. I love taking the time to notice and wonder. It’s a great way to explore a new place and also to allow for re-seeing someplace you already know. For me, the photography aspect keeps me from turning my learning walk into a work-out, speeding by without taking the time to stop and notice something that catches my eye…or ear. I saw so much more than I captured with my camera…the elegant white moths that fluttered around the plants, the way the sky looked through the trees, the tiny white flowers that were enough off the path that I didn’t venture through the brush in my flip flops. I want to provide time for my students to take some learning walks this year. We might take our ipads and do some photography. Or we might take our sketch pads and stop to capture our noticings that way. We might even head out with our writer’s notebooks. Whichever tool we choose, the important part of the process is taking the time to notice…and then taking the time to think and reflect to make sense of the experience once we return. I hope to share some of our class learning walks when school starts in the fall. I invite you to try a learning walk. I’d love to know what you notice and learn along the way. 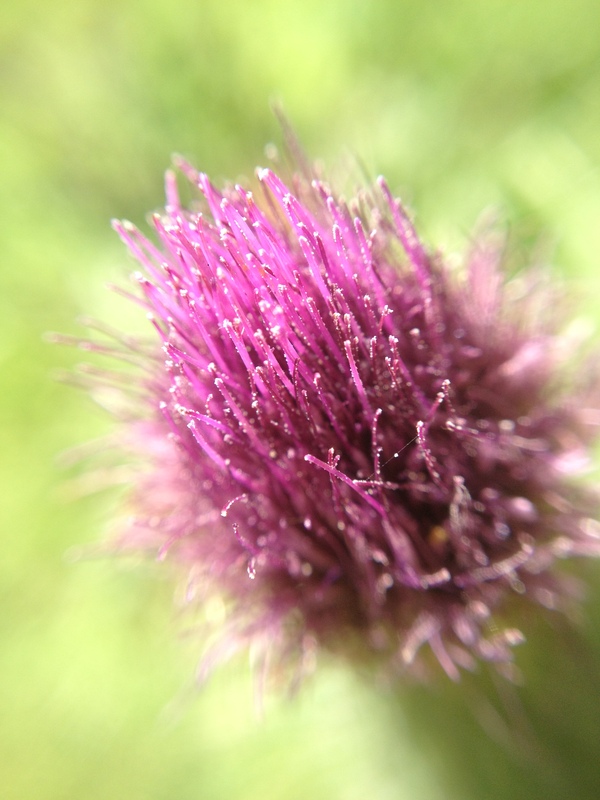 This entry was posted in photography, teaching and tagged connected learning, learning, learning walk, macro, noticing, photography, reflection, sound, teaching on July 21, 2013 by kd0602. Beautiful imagery, Kim. And I love the line that ends “I was not alone on my walk.” What a great reminder to all of us in the many spaces we ramble through. Invitation accepted! I think I’ll document & reflect on my evening commute home. I think it will be rather different than most of the walks I’ve seen on clmooc. I love the relatively random nature of this walk except that it is guided by the simplest possible ‘hand’ of learning. I would love to see a series of these without any text commentary at all or a series that just described what was in the pix but no pix or just exactly how you did it with text and pix. Or maybe the guiding hand would not be learning at all or whatever is orange but rather what you just had to attend to. Or maybe there would be no overt guide at all–blindfold yourself and bring a partner to walk you around to take random, blind pictures. Your reflection has gotten me thinking about how the guide influences the walk, how the teacher influences the learner, and about the limits of that relationship. Cool.